Area in the German growing area Franconia; look there. 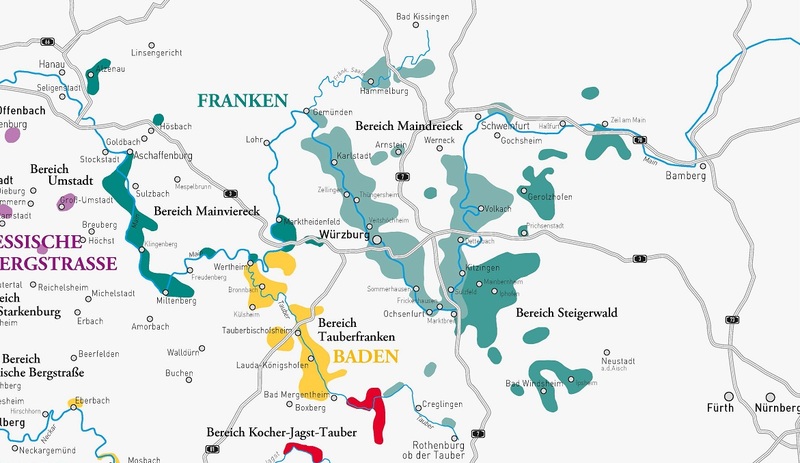 The growing area in Germany with 6,104 hectares of vineyards is located on the northern edge of the state of Bavaria. A special feature is that the Bavarian vineyards on Lake Constance around Lindau to the cultivation area Wuerttemberg belong. The area extends for the most part between Aschaffenburg and Schweinfurt and is operated by Main traversed in a large W-shape. All vineyards are on south facing valley slopes on the banks of the Main or created in side valleys of its tributaries. It is an ancient wine country, this proves a donation certificate from the year 777 to the monastery Fulda, to which the royal estate Hammelburg with eight vineyards (today's castle Saaleck with Schlossberg) was appropriated. From emperor Charlemagne (742-814) is a Gemarkungs description between Randersacker and Würzburg from 14 October 779 documented. The center of Franconia is not only the baroque town from a viticultural point of view Würzburg, where the famous vineyard "Würzburger stone "Is - probably one of the most famous German single layers. A winged word in the Middle Ages was "Frankenwein ist sick wine ". The writer Kurt Tucholsky (1890-1935) perceived the Franconian wine as "deep and pure as a bell". There is a continental climate with dry, warm summers and cold winters. Over 40% of the wines are in bocksbeutel bottled. This bottle shape is protected by law for Franconian quality wines and a wine route is named after it. An important Franconian viticulture pioneer was the owner Sebastian Englerth (1804-1880).